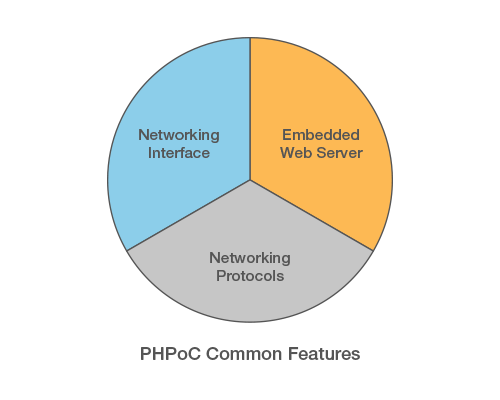 PHPoC offers the option to choose connection type (Ethernet or Wi-Fi) that suits your network environment. PHPoC supports various network protocols (IPv4/IPv6, TCP/UDP, ICMP, DHCP, HTTP, SSH, SMTP, ESMTP, DNS, DDNS, MySQL ...), security protocols (WPA-PSK/WPA2-PSK, WPA-Enterprise(TLS/TTLS/PEAP), SSL/TLS and encryption algorithms (AES, SEED, RC4, 3DES). Users can create their own IoT applications quickly and securely, in just some simple lines of code. Equipped with the Web server and WebSocket server, PHPoC allows users to develop the real-time Web applications for their IoT systems. Monitoring sensors and controlling actuators will be much more convenient.